every once in a while i get asked if you can have both c# and visual basic in the same web site project. my gut response is always to ask "why would you want to" as i always assume it is a new project, etc. to me, it simply wouldn't make sense from a new project standpoint, code reviews, coding standards, continuity, project maintenance, etc. however, people still ask. to-date i never really tried (and that's been my answer). i was presented with a usable scenario of why you may need (not want, need) to do this, so i finally tried it. the answer: yes...kinda...sometimes. 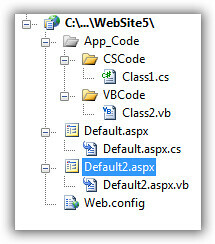 The files '/WebSite5/App_Code/VBCode/Class2.vb' and '/WebSite5/App_Code/CSCode/Class1.cs' use a different language, which is not allowed since they need to be compiled together. and we're done. so if you have some legacy code (let's say a provider) that is in visual basic and your new project is c# (and you've already had the long heated debates with your team on why you are choosing a language over the other), you can implement this option of using codeSubDirectories. now, you can also have multiple pages that have different code-beside languages and that works in this model. however, if you are using the web application project model, this will not work. 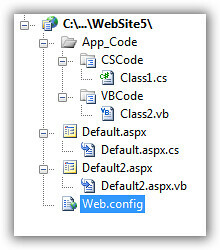 the multiple code files only works inherently (along with codeSubDirectories) with the web site model.